When Osborn Elementary School District received a major grant to put counselors in all their schools, they thought it was good news. But if either of the two current state budget proposals goes through, that grant could put more stress on teachers and students because the funds fall outside the classroom. 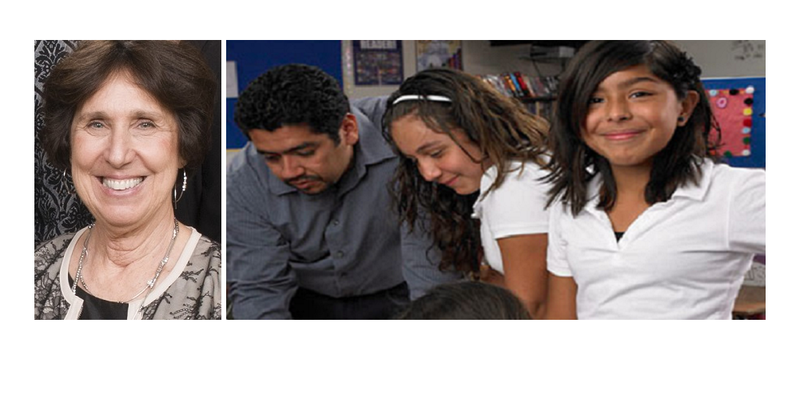 As Arizona’s public school leaders contemplate ways to move an additional five percent into the classroom, many like Osborn’s Superintendent Patricia Tate face several challenges. While Osborn’s actual amount spent in the classroom rose to $4,162 in 2014, above the $3,963 average of its peer districts, the medium-large city district’s percentage in the classroom was 49 percent, below its peer average of 51.5 percent, Tate said. That lower percentage puts the high-achieving Phoenix district with five schools all rated A or B in danger of losing $50 of state funding per student – about $137,850, if Senate Bill 1223 working its way through the Arizona Legislature is approved as two budget proposals move through the House and Senate today. The bill also would affect districts whose classroom spending percentage is less than in the previous year, and there would be no exceptions for any reason. 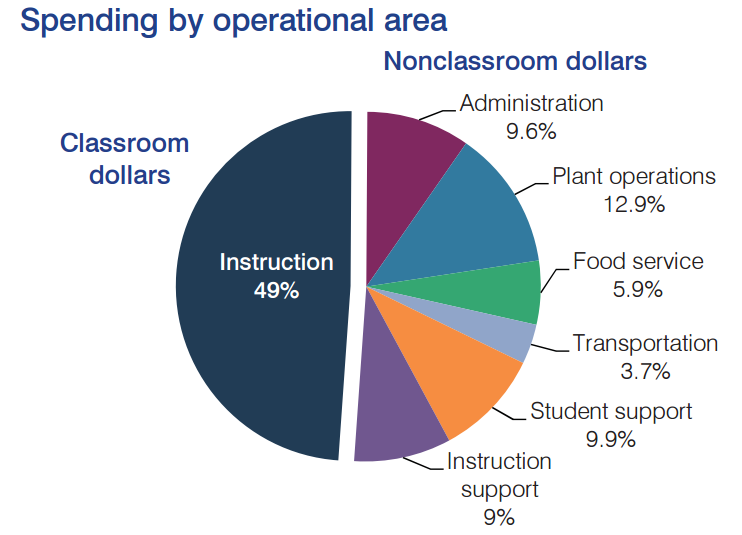 The dollars in the classroom percentages are based on the Arizona School District Spending (Classroom Dollars) Fiscal Year 2014 report released last week by the Arizona Office of the Auditor General. Tate wrote Arizona Gov. Doug Ducey asking him to move the conversation to actual dollars in the classroom instead of the percentage of classroom spending in relation to the overall district budget. Before school leaders can decide where to cut, they must take all federal grants and money off the table, because they cannot legally be moved from one area to another, Tate said. If the auditor general used only state and local funds each district receives that would be “incredibly telling and very informative because then you’re looking at apples and apples,” Tate said. Tate said she doesn’t understand how the governor expects superintendents to sign off that cuts to these nonclassroom categories won’t impact children. “It absolutely will impact children,” Tate said. When you take out federal grants, what’s left? Cleaning materials, custodians, bus drivers, bus aides, health technicians, school secretaries and clerks, Tate said. Schools like businesses depend on a system where each employee has a defined role, and when that role is reduced or eliminated service or production suffers, Tate said. Student support services are often directed at students who are in poverty or have special needs, according to the auditor general’s report. Student support services include nurses, speech pathologists, audiologists, occupational/physical therapy, counselors, psychologists, social workers, attendance clerks, therapies and services provided by contracted vendors and supplies. The district’s poverty rate is 48 percent, 90 percent of students qualify for free- and reduced-lunch, 17 percent of students have disabilities and 40 percent of students move in or out of the district each school year, Tate said. Instructional support includes curriculum directors, special education directors, teacher trainers, librarians, media specialists, instructional information technology staff, other costs related to assisting instructional staff in the delivery of instruction, academic student assessment, contracted services such as teacher training workshops and supplies. “When those two wedges get larger, then the other wedges in the pie get smaller, specifically classroom dollars,” Tate said. When a child is not progressing at the rate they should be, the district looks at what the child needs to achieve, Tate said. Osborn is in its second year of a three-year federal grant that increased the ratio of licensed mental health professionals to students in the districts five K-8 schools. Osborn’s director of student services, Dr. Ginni Shuss, who wrote the counseling grant, said the counselors help develop strategies that help improve children’s learning. 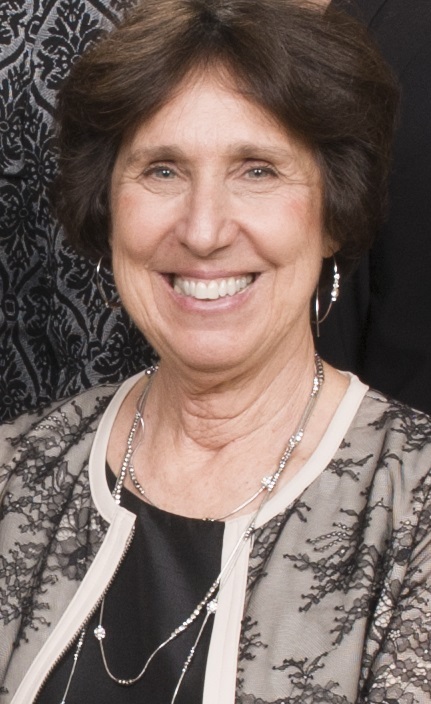 “The counseling staff bring a different perspective to the team of educational professionals who assist teachers with managing challenging behaviors or difficulties with learning such as children with attentional issues or students with anxiety, sensory processing issues or other issues that impact ability to stay focused and on task,” Shuss said. The counselors also provide crisis intervention, small group and individual attention for students, Shuss said. One part of the grant is The Incredible Years Child Program that helps young children build emotion regulation and problem-solving skills through a positive-behavioral approach and puppets. 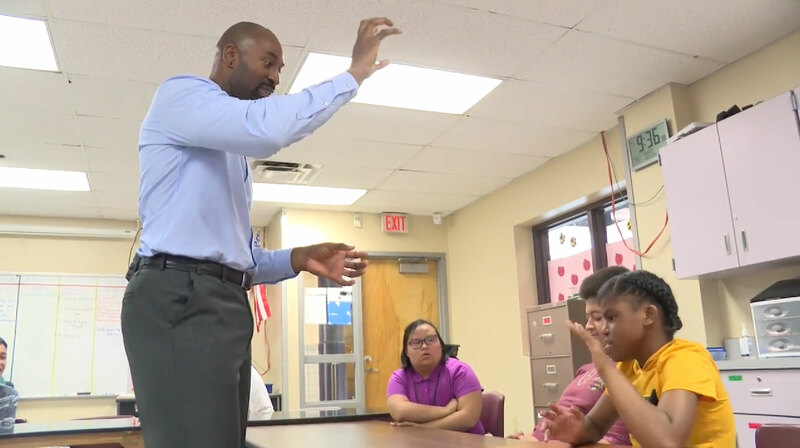 Counselors also work with older students on issues including anxiety, depression, adjustment to school, developmental concerns and social conflicts, Shuss said. Osborn was recently awarded a U.S. Department of Education Arts in Education grant for a partnership with Childsplay to help the district’s English Language Learners’ with language development, Tate said. Since Osborn does not have a grant writer, staff apply for the grants in addition to their usual work, Tate said. The community benefits from our aggressiveness in going after these grants, but “most importantly the children are benefitting,” Tate said. Osborn’s focus on support to help students learn is succeeding, Tate said. 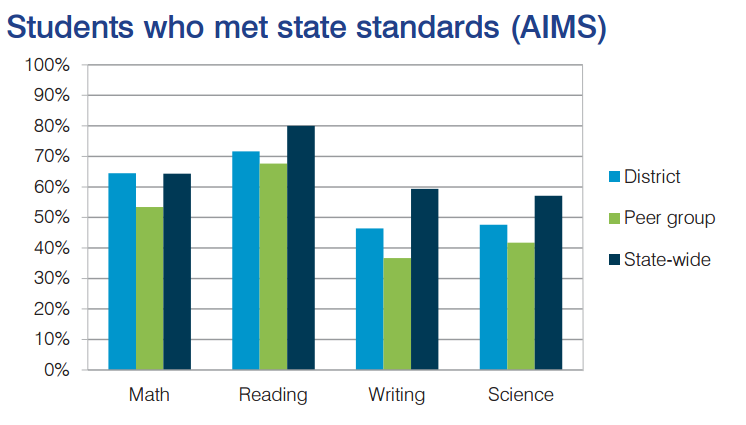 In Osborn, 72 percent of students met or exceeded state reading standards on AIMS, 64 percent in math, 48 percent in science and 46 percent in writing. The district’s students have the highest math and writing scores of the nine districts in their peer achievement group, and rank second in reading and science scores to Wilson Elementary School District, according to the report. The state should look at districts’ student achievement by peer group and ask those whose students are doing well how they spend their money to get those results and what other districts can learn from them, Tate said. “In mathematics, Osborn is even with the state. How can a school with 90 percent free- and reduced-lunch be equal with the state? Think about that. That’s huge, because that’s teaching,” Tate said. In Osborn, 9.6 percent is spent on administration, below their peer efficiency group’s average of 12 percent and less than the national average of 10.9 percent. Administration includes superintendents, principals, business managers, clerical and other staff who perform accounting, payroll, purchasing, warehousing, printing, human resources, administrative technology services, and other costs related to these services and the governing board. “Our administration costs are low,” Tate said. But because of the governor’s proposal to move an additional five percent of current spending into the classroom, “we’ll take a look at it again,” Tate said. One person does payroll for the more than 550 Osborn employees and “half of that person’s salary comes out of indirect costs from federal grants,” Tate said. “When you say overhead, you’re assuming we have way too many people in that part of the pie, but the reality is take the federal grants out and we have few people in that part of the pie,” Tate said. Osborn has reduced plant operations costs over the past few years, but they remain high at 12.9 percent, Tate said. A task force made up of community members, district employees, business owners, builders, architects and representatives from the mayor’s office and parks and recreation continues to work on ideas to present to the governing board for the disposition of the property that would benefit the community, Tate said. Osborn’s food service makes up 5.9 percent of its budget. The more children that Osborn feeds, the more reimbursement money the district receives from the federal government, Tate said. “When you talk about food service costs at Osborn you’re talking about federal dollars, because our food service department is entirely self-sustaining,” Tate said. The food service department puts money in the Osborn indirect costs fund, Tate said. Osborn’s transportation makes up 3.7 percent of its budget. The district has reviewed each bus route, eliminated three routes, and reduced the number of bus drivers to trim transportation spending, Tate said. 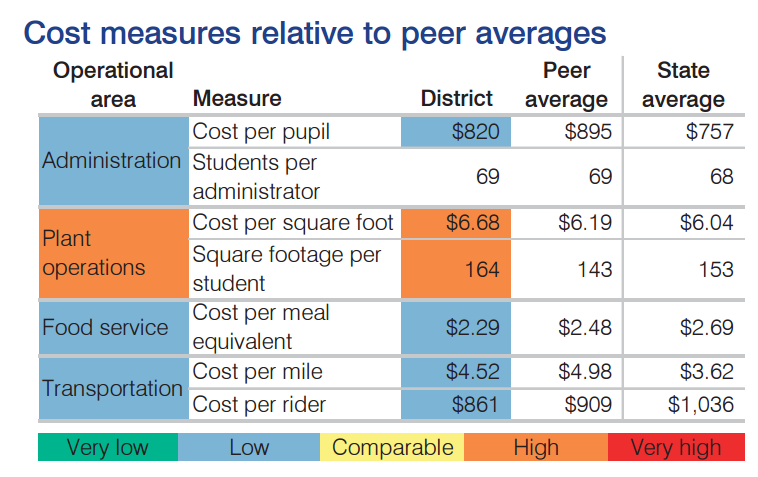 Three factors that increase Osborn’s transportation costs are its higher than average special education population, its location in an urban area with large streets for students to cross and its large population of homeless students, Tate said. “When you have special education children, you are required to transport them separately,” Tate said. Osborn currently operates 13 buses and six of these are for student services – students with disabilities, said John Bachler, Osborn director of transportation. All of these buses have at least one bus attendant, and three of them have two due to the severity of challenges and keeping everyone safe. 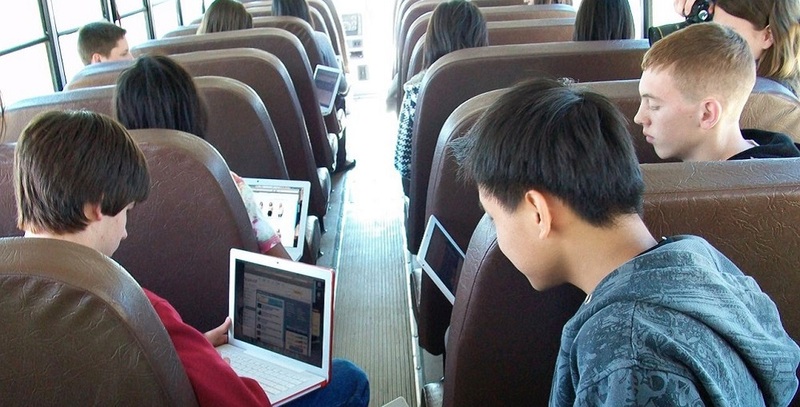 The district has lowered costs by operating two fewer buses for general education students, staggering school release times by 45 minutes, consolidating bus routes and having maintenance personnel drive buses because the Osborn and several other districts cannot hire bus drivers, Bachler said. If the district was to increase the walking zone, “then we’re going to have children crossing eight-lanes of traffic on Indian School Road,” Tate said. 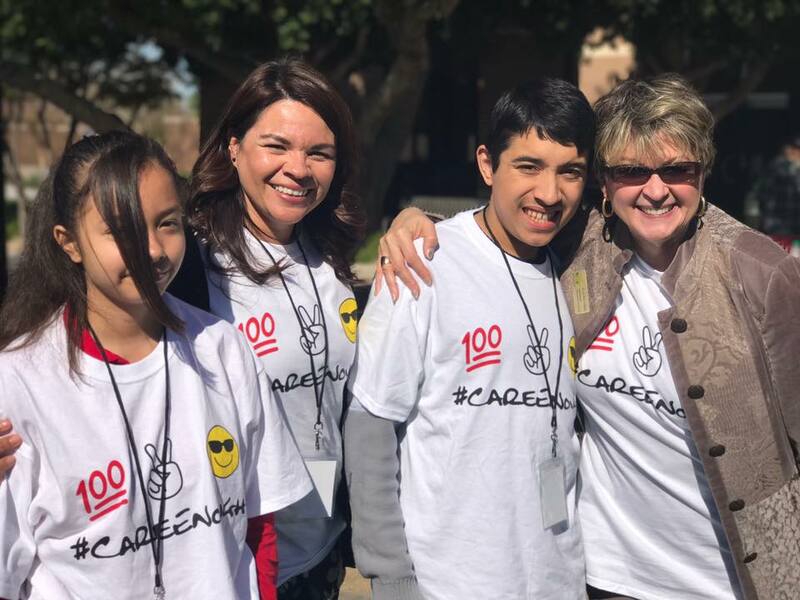 The district transports students into Osborn who are homeless, living in a shelter, or otherwise qualify for McKinney-Vento services, as well as students in Osborn-area shelters whose home school is in another district, Tate said. For many homeless children, school is the most predictable and least chaotic thing in their life, Tate said. It’s where their friends are and the teacher who knows them.